Craft work with a difference. I’m not a typographer. And if my shoddy handwriting is anything to go by, I’m not very good at creating letter shapes either. I am, however, lucky enough to write about design for a living, which means I get to meet all sorts of creative folk who help make people like me experience what it’s like to make something. That’s just what happened at this year’s TYPO Berlin as I got to dabble in a typography tutorial with a difference. For the uninitiated, TYPO Berlin is an international conference where the biggest names in typography and design come together to share their stories, reveal how a project was made, and generally dish out inspirational advice for creatives to put into action. This year we learnt how some technical wizardry with OpenType features can help you design a handwriting font that isn’t boring. Another amazing part of TYPO Berlin is the workshops. Hosted by big names in the design industry, these sessions are an invaluable opportunity to watch experts like logo designer Aaron Draplin in action. This year I dipped my toe into the world of type design first-hand as I attended a Tricotype workshop and created lettering out of a rarely used font medium: wool. As well as being new to typography, I’m also an inexperienced knitter. (My portfolio consists of an unevenly knitted length of wool I generously call a scarf.) Thankfully, just as digital tools can take out some of the strenuous legwork of illustrating, there was a domestic 1970’s knitting machine hired from the Electronic and Textile Institute Berlin that made knitting idiot-proof. That was the knitting process sorted, but what about the typography? In the workshop hosted by artist and videosmith Sam Meech and Jonathan Hitchen, even this became easy thanks to the use of punch cards. With the help of the grids on these punch cards, typographers (and me) can create lettering that looks like a piece of pixel art. All you have to do is pencil-in your letter shapes in the grid, punch out the marked squares with a hole punch, and you’re ready to feed the card into the machine. If you’re familiar with a jacquard loom, you’ll know what happens next. Once the machine has cast on the wool, and you’ve created a few layers by moving the mechanism left to right and back again by hand with a satisfying shunk-shunk, it’s time to feed in the punch card and change the settings. 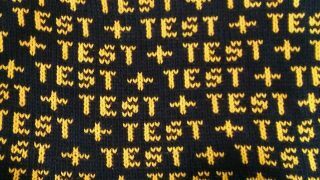 Thanks to a simple turn of a dial, the hooks on the knitting machine change position and start feeding a new strand of wool through the gaps in the punch card grid. A few more shunk-shunks later and the lettering starts to appear. It’s like a combination of ancient computer coding and traditional crafty materials. It only took a few minutes for the punch card design to be knitted. And it turned out that the knitting machine did make the process idiot-proof. Mostly. Occasionally, the wool slipped off one of the many sewing hooks, but luckily Sam was on hand to recast and easily fix these little mistakes. I think they give the finished pieces an extra level of character. Like all of the workshops at TYPO Berlin, this one was incredibly popular. Each workshop walked six people through the process, with each person creating a letter for a knitted alphabet. The finished pieces showcase just how much flexibility there is for type design, even when you’re working with a standard grid. And thanks to the different colours of wool, no two designs looked the same. All of the finished designs will be compiled into a pattern zine so members of the type and knitting community will be able to recreate the letters. Want to stay in the loop for when future workshops are on the horizon? Be sure to bookmark the Tricotype site and check in for updates.